Hamlet. Dir. Laurence Olivier. Perf. Laurence Olivier, Jean Simmons, Basil Sydney, Eileen Herlie, Norman Wooland, Felix Aylmer, and Terence Morgan. 1948. DVD. Criterion, 2000. 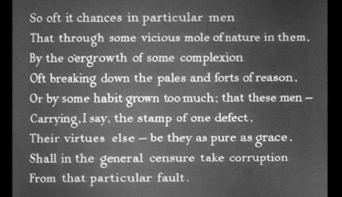 Olivier’s Hamlet begins with an edited version of a speech from I.iv (the full version is printed below). This is the tragedy of a man who could not make up his mind. Those two separate speech acts (to sound like a post-structuralist literary critic for a minute) are intriguing. The tone of the first is that it’s rather a shame that a person might be so defined; the second does just that with Hamlet himself. Our encounter with the vastidity of representations of Hamlet show us that his character, perhaps more than some others, has an enormous complexity—which makes it all the more of a shame that he should be defined by one element. But . . . perhaps . . . perhaps it’s impossible not to present Hamlet in simplified form. After all, it’s only after studying this wide ranges of Hamlets that we get a greater and greater sense of that complexity. I think I’ll go watch a five-minute silent version of Hamlet. Simplicity has its appeal. Ah, 1948. Ah, Orson Welles. "Speak the speech, I pray you . . . Breaking News: Dudencrantz and Doggenstern! Almereyda's Hamlet: "This is the Tragedy . . ."